Multani Mal Modi College has won the Punjabi University Inter-College Wrestling Championship (Men). College Wrestling (Men) team won the ‘Greeko’ event by defeating the team of Govt. Barjindra College, Faridkot. Modi college team secured 2nd position in ‘Free Style’ Wrestling event of the championship. The Inter-College Wrestling Championship was organized at Govt. 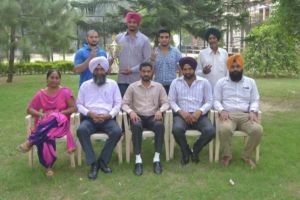 Barjindra College, Faridkot, in which 30 teams of different colleges participated. The overall Wrestling Championship (Men) was bagged by Multani Mal Modi College, Patiala. While welcoming the winning team at the college, the college Principal, Dr. Khushvinder Kumar congratulated the team members and assured that college will keep on providing the best facilities to the college sports persons. The Principal said that these sportspersons will be duly rewarded during the Annual Prize Distribution Function of the College. Dr. Gurdeep Singh, Dean, Sports of the College congratulated the winning team and informed that college wrestlers Pardeep Singh, Baljinder Singh, Gurmeet Singh, Bikram, Pankaj Kumar and Pankaj Yadav performed very well in this inter-college championship. He also told that our wrestlers Baljinder Singh and Gurpreet Singh won gold medals in Free Style Wrestling event. The Principal applauded the sincere efforts of Prof. Nishan Singh, Head, Sports Dept., Prof. Harneet Singh and Prof. (Ms.) Mandeep Kaur.